I recently went to an exhibit of paintings by Franklin D. Speyers, one of my college roommates. Frank currently has a show entitled “West of the Imagination” at the Center Art Gallery of Calvin College, the school where we both earned bachelor’s degrees and he now teaches. 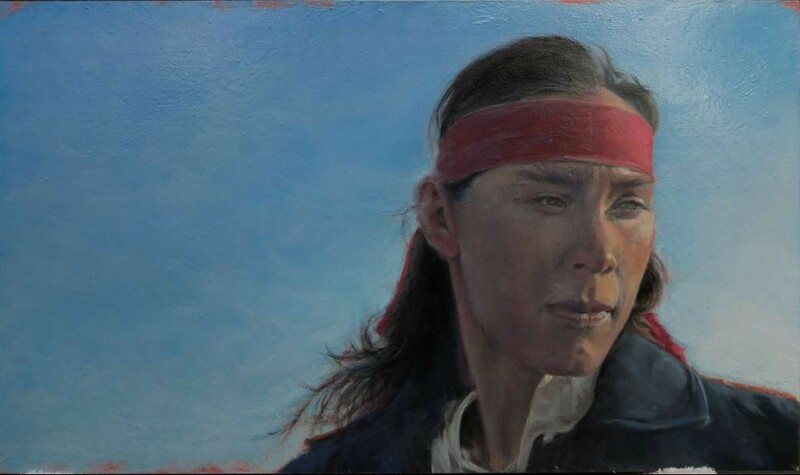 The works on display–of scenes from the American West–are the fruit of a sabbatical a few years ago. I knew Frank had made some trips out West, but I didn’t know the intensity of his interest in things Western. He described the development of this interest in an interview with Cowboys and Indians magazine a few months ago. This post will discuss a few of the paintings in the show, not just because I think they are worthy of attention but because they made me reflect on Frank’s journey over the years and on what his journey says about all our journeys. Frank seems interested in getting at the essence of a person, in seeing each subject for who he or she is, warts and all. I own a painting Frank did of me when he was a college student. The style is different from his recent works, but there is a continuity between the two. Then as now, he was trying to get at some underlying reality or truth about his subjects. 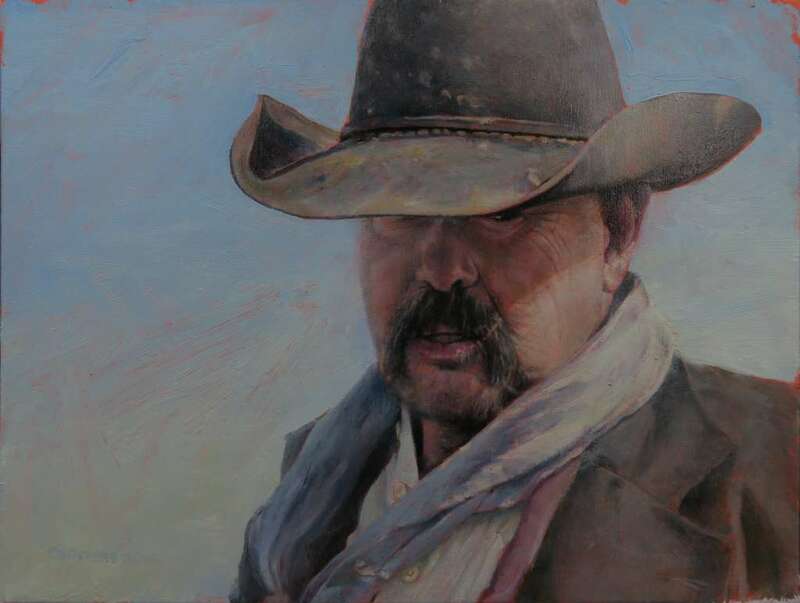 Frank told Cowboys and Indians that, unlike many Western artists, “my primary orientation isn’t as much with narrative as it is with the iconicity of each piece.” That’s what I think Frank was doing well before he went out West to paint. Perhaps each of us have one or a few preoccupations that emerge in whatever we do. Frank seems preoccupied with inner essence. At some point I intend to give thought to what my preoccupations have been. Not all the paintings in the show are portraits; there are a number of landscapes or, more characteristically, scenes in which human activity is overshadowed by the natural world. 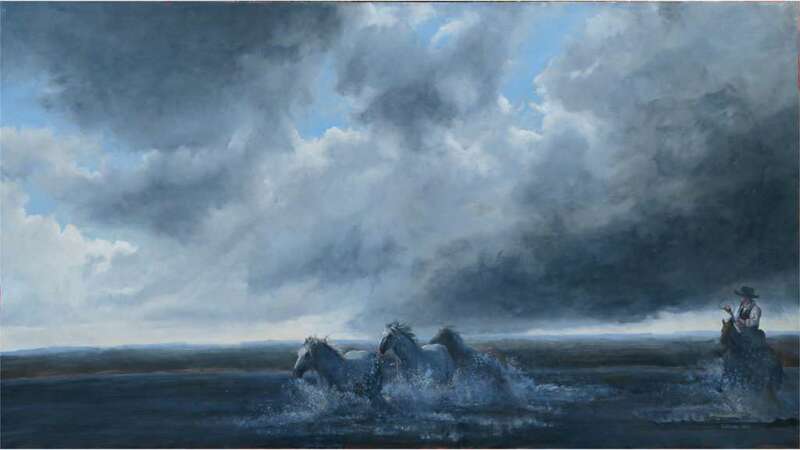 Many scenes are mostly sky, typically with imposing, majestic clouds. The portrayal of land and sky seems aimed at something more than just representing nature. I emailed Frank to express my appreciation for the exhibit. In his reply, he referenced an article by Alan Noble entitled “The Disruptive Witness of Art.” Noble refers to Charles Taylor’s concept of the immanent frame–the idea that modern secularism has drained the cosmos of divinity, leaving us with an impersonal world devoid of the transcendent. Taylor suggested that we who are captive to the immanent frame can be freed by art and literature that depicts transcendence within immanence–that expands the narrow frame within which we live to reveal what lies outside of it. 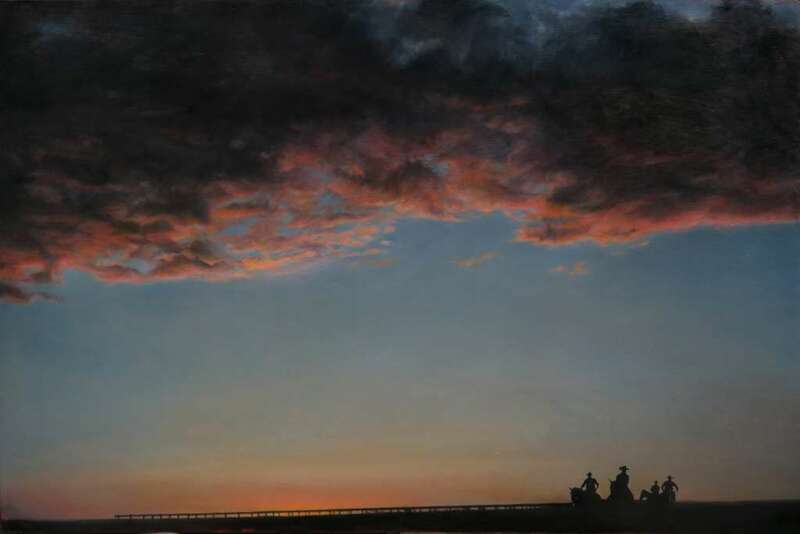 Frank says of his work that “it seeks to lean against closed immanence so prevalent in modern works today.” This is most evident in paintings such as “Ours”, showing a few horsemen dwarfed by dark clouds that are rouged by the setting sun. 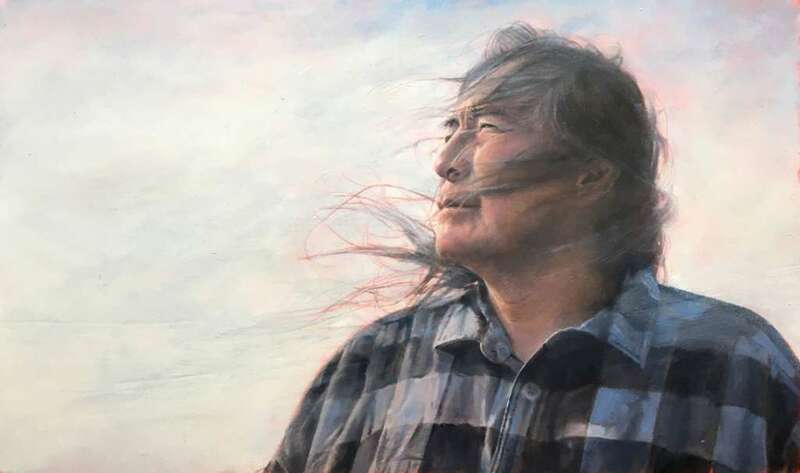 A middle-aged Native American, wind wrapping his hair around his face, gazes at something beyond the pictorial frame. In all likelihood, his gaze is directing our attention to the transcendent. When Frank was 20, he was a person of faith. I’m indebted to him for the lived example of Christianity he provided when I was still trying to figure out who I was and what I believed. Now that he is 70, there is a clear continuity with who he was then, but also a difference. His paintings suggest to me a deepening of his sense of what is sacred or supernatural. There seems to me more of a melding of his interest in the transcendent with the preoccupation I mentioned earlier, that of getting at some underlying truth or essence in whatever subject he paints. Perhaps having a lifelong vocation works like this: we remain oriented towards some subject or activity that has always interested us, but we explore it ever more fully as our life experience gives us greater capacity to plumb its depths. That gives me something to think about as I reflect on my own vocation. And Frank, I’d love to see a retrospective of your 50 years as an artist! This entry was posted in Culture, Psyche, Spirit and tagged aging, art, Charles Taylor, faith, Franklin D. Speyers, transcendence, Western art. Bookmark the permalink. Beautifully written piece of a gorgeous and breath taking body of work. Thanks to both of you gentlemen!